Mermaid’s Gold takes the usual theme which involves the beautiful women with tails of fish instead of feet, and adds a generous amount of gold, to make it even more appealing. It doesn’t stop at just one mermaid though, five different beautiful creatures of the sea being seen in the symbols and in the background image. The game was created by WMS, and while it doesn’t have a theme that is completely new, it adapted the topic and made it its own. 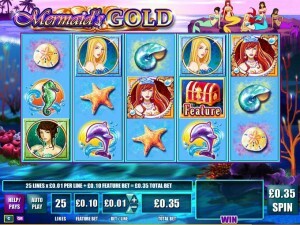 25 paylines are used in Mermaid’s Gold, a 5 reel slot. Wilds, scatters and a wealth of randomly triggered bonus games are all used by the game to make it more entertaining and profitable. There is a top prize of $30,000 on the line. 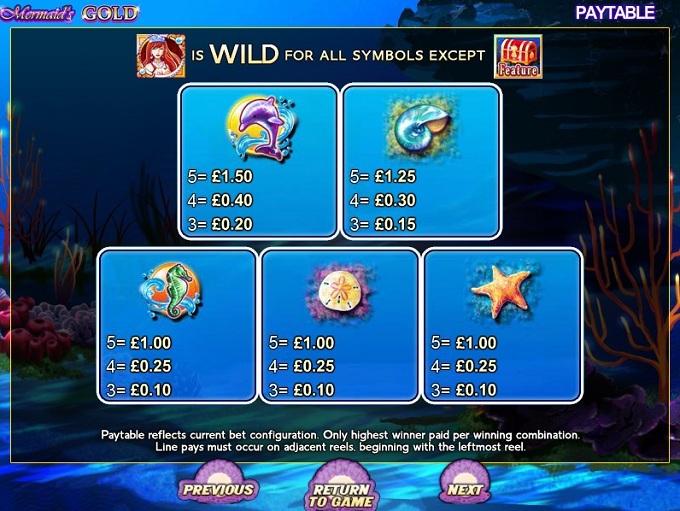 The game has the usual wild symbol and a scatter, but the really attractive part comes in the form of six different features, each with a different mermaid as its patron. The Gold Mermaid is the star in the game, and the only one to wear a crown. The Gold Queen is the one that acts as the game’s wild feature, meaning that you can expect it to act as a substitute when it lands in the right location, with the other matching icons of the combo in place as well. Wilds are more than capable of offering prizes directly, and they’re the best ones of the game actually, going as high as 10,000 coins. This feature gets started when the scatter symbol gets involved, the one with the Treasure Chest on it. Three symbols will be sufficient to get it to start, and it doesn’t even matter where they are on the reels. Another way to get this feature is through the Gold or Blue Mermaid features. You have to make picks from the treasure chests displayed until you discover three identical mermaids. If you get four matching mermaids, the prize is worth 2x as more. After any random spin, there is a chance that the game will trigger one of its mermaid features. 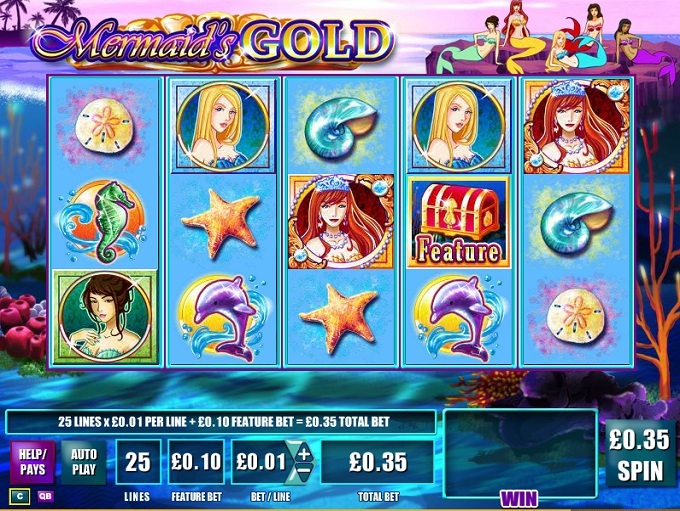 If you get the feature of the Gold Mermaid, then you are shown a number of shells and you have to pick one, to get between 5 and 20 free spins. Multipliers that are applied to their wins vary between 2x and 10x. With the Purple Mermaid, you’re getting three random numbers, which go from 0 to 9 each one. They are then arranged into place, in a random order, to get you the value of your prize. Get a Red Mermaid bonus to trigger, and your reward will be another choice between shells, but one which now brings you prizes when you discover the mermaid kisses. Payouts of up to 200x are offered in each case, with a maximum of 10 kisses being hidden. 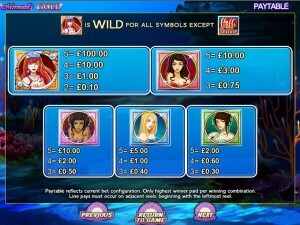 The shell game which comes from the Green Mermaid bonus will trigger payouts of up to 500x the line wager. Finally, we have a Blue Mermaid bonus, which gives away spins with super scatters. Whatever the position of the symbols on the reels, they are taken into account and they form combinations, even if they’re not on the same payline. 1 to 3 of these special spins are given by this feature. There are two sides to any bet that you place in Mermaid’s Gold. There is the bet on the 25 lines first, with 25 coins in it. Next, we have the feature bet, which requires another 10 coins. Since coins go from $0.01 to $3, you can wager at most $105 each spin. The prize is impressive, at least for a WMS game, going as high as 10,000x the line bet, or the same number of coins. You can win anywhere between $100 and $30,000 in this slot, depending on the coin denomination you were working with. 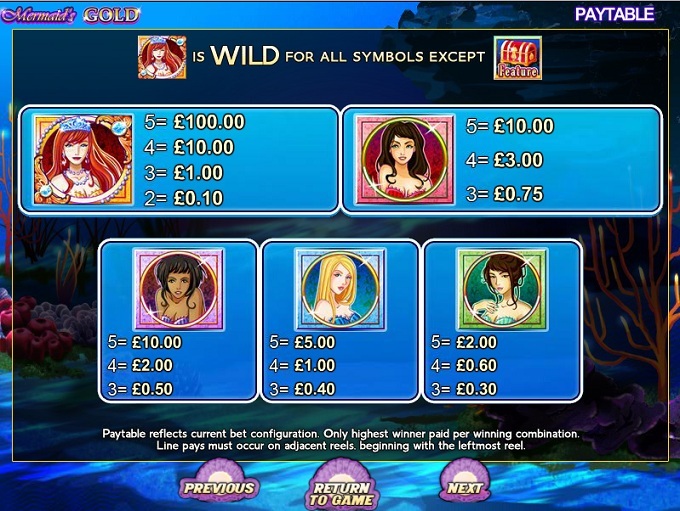 It’s one of the more attractive slot machines that WMS has created, and the reason has to do a lot with the five attractive mermaids that appear on the reels and in the background. It’s not all that you’re offered though. The game has high quality images for all its symbols, and they’re all with the same marine theme. An image which shows both the part from above and under the ocean’s surface is used for the background. Symbols: Gold Mermaid (10,000 coins, wild), Treasure Chest (scatter), Red Mermaid (1,000 coins), Purple Mermaid (1,000 coins), Blue Mermaid (500 coins), Green Mermaid (200 coins), Dolphin (150 coins), Shell (125 coins), Seahorse (100 coins), Starfish (100 coins) and Round Shell (100 coins). I think you’re going to have a lot of fun with this slot. The randomly triggered features, the pretty mermaids and the big prizes will make sure of that. 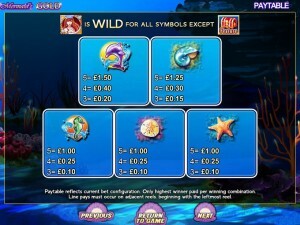 The Mermaid’s Gold slot machine is offered through the WMS platform, so if you want to play it for real or just to practice, look out for casinos that use it.